« Theresa May ‘determined’ to leave EU in March & should you have a ‘Brexit box’? Statement: The Catholic Church is the only true church. Response: According to God’s Word, the true church submits to its one Head, the Lord Jesus Christ, and is made up of all who are born again (1 Cor. 12:13; Col. 1:18). Its doctrine, practices and precepts were recorded in the New Testament, which is the supreme authority to the exclusion of all others. The Roman Catholic Church cannot be the true Church because none of the following Catholic traditions and rituals are found in Scripture: praying to Mary and saints, venerating Mary, submitting to a pope, infallible bishops, venial sins not causing spiritual death, praying for souls in purgatory, a sacerdotal priesthood, the propitiatory sacrifice of the Mass, baptizing infants, dispensing grace through sacraments, or successors of the apostles after Paul and Matthias. The Catholic Church may trace its origin back to the first century, but it did not heed the prophetic warnings of Christ and the apostles. They gave stern warnings that the church would have to fight against false teachers and apostasy. Paul pleaded with the Ephesian elders to be on the alert, because “after my departure savage wolves will come in among you, not sparing the flock; from among your own selves men will arise, speaking perverse things, to draw away the disciples after them” (Acts 20:29-30). He also warned that some will fall away from the faith, paying attention to deceitful spirits and doctrines of demons (1 Tim. 4:1). 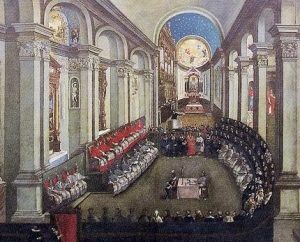 The Catholic Church officially and dogmatically departed from the faith of the apostles at the 16th century Council of Trent. Therefore, it must be called an apostate church, along with the many protestant churches that have departed from the faith. While Mike Gendron often has interesting information in his newsletter, the above contains a couple of points that are serious historical errors. So, let’s look at them in the order they were in the above article. First, according to the Bible, the true church is made up of people who have been begotten by God and have the Spirit of Christ in them (Romans 8:9-11). The Bible, and early theological writers, taught that humans are not born again until the resurrection (for details, see Born Again: A Question of Semantics?). The reason I did not include Mike Gendron’s comment “or successors of the apostles after Paul and Matthias” is that scripture as well as early church history indicates that people like Jesus’ brother James (Galatians 1:19) and others were considered to be apostles (some suspect that Andronicus and Junia, mentioned in Romans 16:7 were apostles). Plus there were various statements that the Apostle Paul was inspired to write (1 Corinthians 12:28; 2 Corinthians 11:13; Ephesians 4:11). Consider that there would be no reason to say that there would be false apostles, if the position was that there could not be further apostles past Paul (1 Corinthians 1:1) and Matthias (Acts 1:26). As far as succession goes, the Bible teaches the laying on of hands, which can be perceived as a type of apostolic succession. Another issue to bring up is that while the Church of Rome claims to trace its origins to the first century, that is more of a widely accepted claim as opposed to historical fact. History, “the teacher of life”, teaches that there were no popes in the modern sense of the word (that is, as the sole Bishop of Rome) until the middle of the second century. Until then, the church of Rome was governed not by a single bishop but by a committee or council of elders and presbyter-bishops, perhaps with one individual acting as the body’s convener or chair. Those prominent in the Roman community may have been the ones whom the Catholic Church regards as immediate successors of Peter himself: Linus, Anacletus, Clement, Evaristus, et al. But we cannot be certain. It is significant, for example, that when St. Ignatius of Antioch (d ca. 107) addressed his famous letters to the various churches of the Mediterranean world, the letter to Rome was the only one in which the local bishop is not mentioned. Indeed, there is no evidence that Peter himself ever functioned in an episcopal role in Rome. Although traditionally regarded as the founder of the church there along with the Apostle Paul, Peter was not even present when Christianity first came to Rome in the early 40s (McBrien, Richard P. Lives of the Popes: The Pontiffs from St. Peter to Benedict XVI. Harper, San Francisco, 2005 updated ed., p. 396). And that is certainly correct concerning Rome. There were no “bishops of Rome” in the first century and certain Roman Catholic scholars understand this (see What Do Roman Catholic Scholars Actually Teach About Early Church History? ), hence the idea that there is an unbroken line of bishops in apostolic succession from Rome in the first century is false (more information can be found in the article Apostolic Succession). The next point to mention is that while traditionally, Protestants trace themselves through the Church of Rome until the Protestant Reformation and the Council of Trent in the 16th century. One is, that although it was the Council of Trent that officially adopted extra books for the Old Testament (called the deuterocanonical books; see also The Old Testament Canon), the Church of Rome already had many doctrines based on traditions and non-biblical ideas well before the time the Protestants split from them. The reality is that the Protestant faith also accepted many non-biblical traditions that the Church of Rome had. Polycarp, Melito, Thraseas, and Theophilus. Variations of the different gospels have been accepted by essentially all of the Greco-Roman faiths. Allegory, improper tradition, improper festivals, and improper apparitions sometimes sources of doctrine. Apostle John in Ephesus. Also by Melito of Sardis and others. Variations adopted by Greco-Roman faiths. c. 155 A.D. by Polycarp and later by Theophilus. Rome tolerates anti-Sabbath teaching to this day. Ten Com- mandments done away. Exceptions to the Ten Command -ments accepted to this day. This is the part of what Paul called the “mystery of lawlessness” of 2 Thessa-lonians 2:7.
c. 170 A.D. by Melito. Later by Nepos. c. 180 Marcion excommunicat-ed, but heresy later accepted. c. 155 A.D. by Polycarp. Still accepted; adopted by Council in 381.
c. 155 A.D. by Polycarp; c. 170 A.D. by Melito. c. 180 A.D. Valentinus was excommunicat-ed, but heresy still accepted. c. 195 A.D. by Polycrates. c. 157 A.D. by Thraseas and later others, like Apollonius. c.206-218 A.D. Montanists finally denounced. Later adopted and now still accepted. Tradition originated in the “Gospel of James” circa 120-200 A.D.
Mary remained a virgin after giving birth to Jesus or Mary is a perpetual virgin. c. 200 by some in Asia Minor and Jewish-Christians. Adopted as the 5th General Council of Constantinople in 553 granted “perpetual virgin” title to Mary. Now a Catholic dogma. c. 220 A.D. finally denounced; though a version still accepted. c. 200 by Serapion of Antioch. Platonic-Gnostic and pagan sources, including Justin Martyr claiming Plato. Cross is a Christian religious symbol of signing and/or veneration. c. 4th-7th centuries by Paulicians of Armenia and Asia Minor. It could have been denounced prior, but the practice was not so widespread in Asia Minor earlier. This heresy started to appear in the 2nd century and was essentially finally formally adopted at a council in 843. Note: All of those listed as Heretics are considered heretics to this day by the Church of Rome. Although Greco-Roman supporting leaders outside of Asia Minor/Antioch sometimes denounced these particular heretics, their churches often ended up adopting portions of their heresies. There were other heresies introduced in the 2nd to 4th centuries that were never accepted by the faithful Quartodeciman successors to the 2nd century Asia Minor leaders, as they did not teach the Jewish apocrypha, special dress for the clergy, clerical celibacy, immortal souls going to heaven, baptism by sprinkling, unclean meat consumption, military service for Christians, a mystic Eucharist, or a winter holiday somewhat coinciding with Saturnalia/Mithra ceremonies, etc. Even certain Catholic/Orthodox “saints” in the first few centuries originally condemned many of those particular doctrines. Variations of such teachings are now accepted by the Roman and Eastern Orthodox Catholics. Historical evidence shows that leaders in Asia Minor denounced heresies generally before Rome did. And sadly, Rome adopted and/or later accepted some version of many of these denounced heresies. Protestants also adopted many of them. All who profess Christ should “contend earnestly for the faith once for all delivered to the saints” (Jude 3). This includes not only the Roman and Eastern Orthodox Catholics, but the Protestants as well. This entry was posted on Sunday, February 3rd, 2019 at 4:00 pm	and is filed under Church History, Doctrine, Religious News. Myths About or From the Church of Rome?